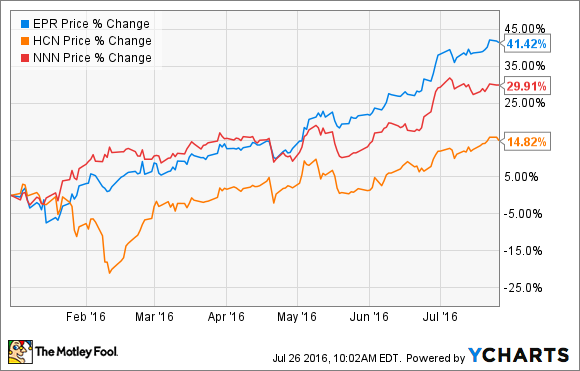 REITs belong in every dividend-lover's portfolio -- here's why. Real estate investment trusts, or REITs, belong in the long-term portfolios of all income-seeking stock investors. The high income potential and favorable tax structure of REITs generally result in impressive dividends, and real estate appreciation can produce some pretty impressive growth over time. Here's why you should seriously consider adding some REITs to your long-term investment strategy, and three in particular you may want to consider. Simply put, REITs are some of the best dividend stocks out there. As long as a REIT pays out at least 90% of its net income to shareholders, it isn't taxed on the corporate level, unlike most other dividend stocks. For example, let's say a certain corporation earns a profit of $20 million. Not only will this be taxed at the corporate level, which is at rates of up to 39%, but when the company pays its dividend to shareholders, it is taxed again (assuming it's held in a taxable account). Effectively, the profit can be cut in half before it gets into investors' hands. A REIT can pass the entire $20 million through to its investors, which is a big reason REIT dividends are some of the highest in the market. The downside is that REIT dividends are generally ineligible for favorable "qualified dividend" tax rates, but it still often works out in investors' favor. And, if you hold REIT stocks in a tax-advantaged account like an IRA, you won't have to worry about dividend taxes at all. Not only are the tax advantages great, but you'll also get the benefit of property appreciation as the value of the owned real estate increases over time. In a nutshell, REITs can be an excellent combination of income and growth. 1. Welltower (NYSE:WELL) -- Welltower is a massive REIT specializing in healthcare real estate, particularly senior housing. The company has been growing aggressively in recent years, and there's no reason to think the growth will slow down anytime soon. Specifically, the U.S. population of senior citizens is growing rapidly, and the 65+ age group is expected to nearly double by 2050. In addition, healthcare costs have been increasing at a faster rate than overall inflation, and the healthcare REIT market is still highly fragmented. In other words, demand for senior housing will continue to grow, cost trends are favorable, and there are plenty of opportunities to acquire existing properties. Welltower has been around since 1971, and during that 45-year history, the company's dividend has grown at an annualized rate of 5.7%, and investors have enjoyed total returns averaging 15.6% per year -- a remarkable level of performance to sustain over more than four decades. 2. EPR Properties (NYSE:EPR) -- EPR Properties is a unique REIT, specializing in three different types of properties -- entertainment, recreation, and education. The company's entertainment properties include megaplex theaters and entertainment centers, recreation properties consist of water parks, golf entertainment complexes, and metro ski parks, and the education properties include charter schools and early childhood education properties, to name a few types. These types of businesses inherently have excellent tenant retention. After all, movie theater operators don't usually just pick up and move, and the same can be said for water parks and schools. EPR has an impressive 98.8% occupancy rate as a result of this, and the property types are experiencing strong demand and revenue growth. Throughout its 19-year history, EPR Properties has generated annualized returns of 16.3%, and its 4.6% dividend (paid in monthly installments) makes this lesser-known REIT worth a closer look. Non-discretionary businesses that sell items people need. Drugstores and gas stations are great examples of this. Service-based businesses such as movie theaters and auto repair businesses that people need to physically go to. Deep discounters like dollar stores and warehouse clubs. These businesses sell items at prices even online retailers generally can't beat. In other words, there's little threat of online competitors stealing these businesses' market share, which has haunted many other types of retail. And, all three types hold up well during tough economic times. This is why National Retail Properties has maintained a near-perfect occupancy rate and has been able to increase its dividend for 26 consecutive years. To be clear, there are a few dozen REITs I consider to be great choices for dividend investors, so this is by no means intended to be an exhaustive list. However, these are three of my favorite REITs right now, and the reasoning discussed here can be applied to other REITs when doing your own research. As a final thought, if you do your homework on these and other REITs, you'll see that they've performed extraordinarily well recently. On this list, Welltower has risen 47% since its February lows, and EPR and National Retail Properties are up by 41% and 30% year to date, respectively. There are a few good reasons for this. For one thing, it looks like interest rates will stay low for much longer than experts thought. Not only does this make it cheaper for REITs to borrow money, but it makes their yields more appealing to investors. Market volatility is another positive catalyst -- as I discussed, REIT profits and dividends are pretty consistent, and when the market fluctuates rapidly, stability is attractive. While it's true that these stocks aren't as attractive as they were six months ago, given their long-term return potential, I think these REITs are still fairly valued. Plus, continued access to cheap capital could set them up for higher-than-expected profits in the future.